Thanks Sally for the nomination. After reading your runner profile, I’m a little worried about keeping up the high standards of work but I’ll give it a try…. Living in a small village (Nacton) we didn’t do a great deal of sport. Mainly we played rounders and a little football but we were pretty terrible at it. The only other sport we participated in at primary school was…wait for it…yes, our old friend cross country which even then I loved. In our last year we got to race cross country at Orwell High School with the big boys. What a day although I can’t remember how I did. At high school we had to play rugby for the first two years as well as gym. I enjoyed all sports at high school even though I was mediocre at best. After I left school I played a lot of football but mainly five-a-side. 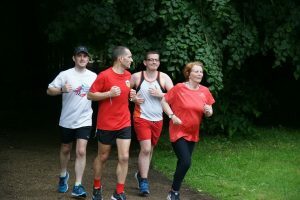 Early running days: In 2010, me and two of my brothers – Rob and Alex – decided to do a bit of running to keep fit. We met up at our parents’ house in Nacton Village and we would run up to Nacton shores, through Levington Creek, up the old A45 and back to Nacton, around a six mile loop. 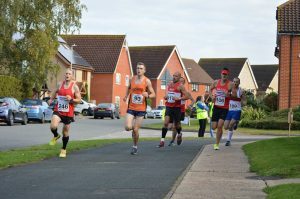 After a few months of this, we got wind of a half marathon up the road in Felixstowe so for the next few months we trained in Felixstowe, running one lap of the half marathon course. The big day came and we made our way to the Felixstowe Leisure Centre, adorned our race numbers and lined up at the back of the crowd on the start line. The klaxon went off and the race was on. Me and my brother Rob ran together for about the first seven or eight miles, leaving Alex slightly behind, then Rob slowed up, blaming a cold. I struggled on and finished in about two hours, nine minutes and five seconds. I was very pleased with this at the time! After this I stopped running for a while. 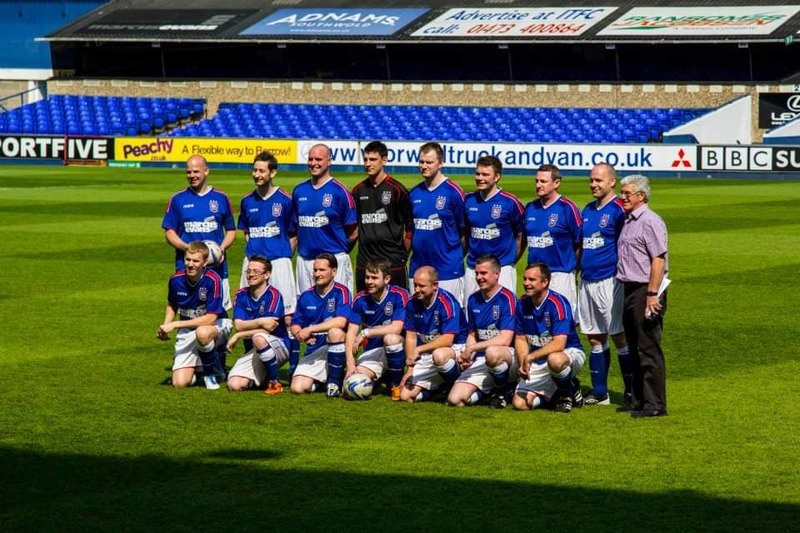 I was still playing five-a-side with work colleagues and in 2013 I got the chance to play in an eleven-a-side game at Portman Road in the Portman Cup (a charity game). My boss paid for me and another colleague to play. 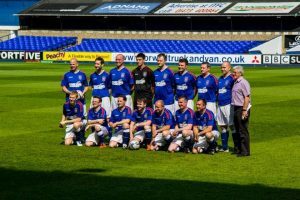 It was a great day although the football was a little bit flat until the eightieth minute when I scored the winning goal. Happy days! Skip forward to 2014. One early Saturday morning, I was walking my daughter to her ballet lesson. As we walked down the hill on Woodbridge Road, I suddenly felt a tap on the back. It was my brother Alex, clad in a T-shirt and shorts. ‘Where the hell are you off too?’ I asked. ‘To Park Run,’ he answered. ‘Park Run? What is that?’ I enquired. He explained what it was and if he didn’t get a move on, he would be late. I let him go on his merry way and dropped my daughter off at The Regent. I then decided to buy some drinks and meet Alex at the finish line in Christchurch Park. As I entered the park, I could see all of the runners entering the finishing funnel. As I watched, I clocked Alex as he finished, surprised to see me but quite grateful for the drink. After this, I said that I would run the next week and did and I don’t think I’ve missed many since. Well, a lot of the runners who have preceded me in writing their profiles have written about the race they did well in and enjoyed. Well, I have many races like that but I have to say, my most memorable race has to be – Oh yes – the dreaded Turkey Trot (2017). Not because I did well or because I loved it, but because it was the most horrendous race I have ever run in my life. 10/12/2017 – I was offered a lift to Beccles by Robin Harper so early Sunday morning I met up with Robin and I’m sure, another couple of people but I can’t quite remember who. As we went on our way up to Beccles, the weather had noticeably got worse with strong winds, rain, snow and sleet, along with minus temperatures. All of us in the car were optimistic about it, saying it would probably pass by the time we got there. Well, we arrived at the race HQ, got our race numbers and pinned them to our vests. The weather hadn’t got any better and the chatter between all of the runners turned to what we were going to wear to race in. Me and Robin opted for only race vest and shorts. Others had base layers, leggings, etc. I stupidly even forgot to bring my gloves – what a fool! The time had come to brace the weather and get to the start line. A bit chilly but not too bad, I said to myself. The klaxon went and we were off. I had a good, fast start and was up at the front of the race, along with Rudolph the Reindeer. I was doing ok for a while, then we turned into the wind. Suddenly I could feel the sleet and snow in my face. Damn, it felt cold now! Quite quickly my wellbeing got worse and worse. Every time I went past a marshal, I contemplated throwing in the towel but sitting in the back of a marshal’s car probably wouldn’t help me very much so I decided to keep the pace up and finish the race as soon as possible. The next few miles, I spent passing and being passed by Rudolph in an epic battle through icy puddles and slushy sleet and snow. Around mile eight, my body had had enough. 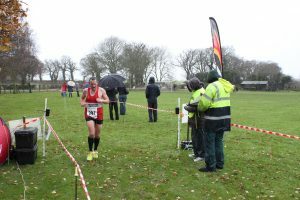 My cold, wet, race vest had ended up giving me horrendous stomach cramps and I couldn’t quite keep up the same pace. I had to let Rudolph go and a few others came past in the final mile. Then I crossed the finish line and received my Christmas pudding. At last it was over and I had survived. I headed back to race HQ as I was desperate for the toilet. But it was so cold it wasn’t physically possible so I opted to get my wet things off and find a radiator. Luckily I had brought a towel and some fresh clothes. I thought I had it bad but then I saw Harper walking into HQ. He must have hugged that radiator for a whole hour. After a while and a few cuppa’s, we were all back to our best. One to remember. 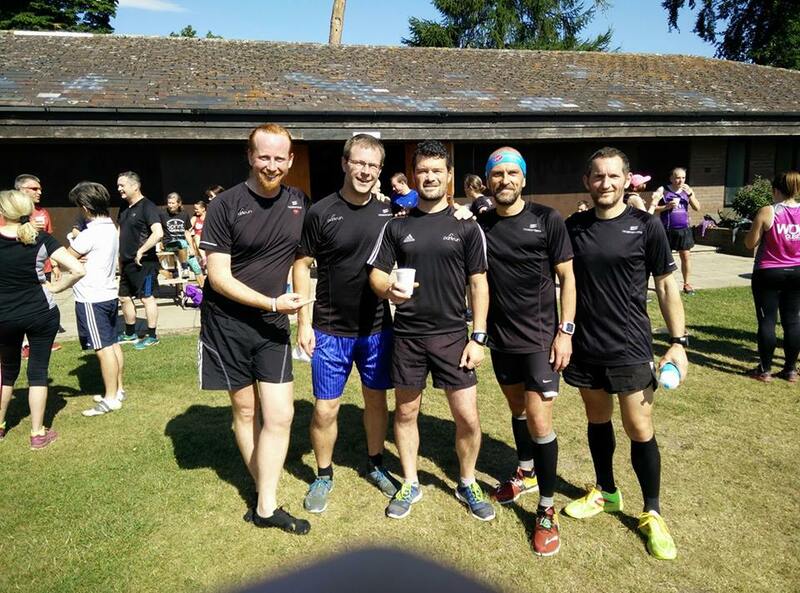 There are a few races that I really like – The Twilight 10K, Ekiden, RNR – as well as our club social races Two Rivers and Run Bike Run, but my favourite race would have to be Martlesham 10K 2017. The week started with the family looking forward to a weekend at Center Parcs. Well Tuesday comes along. That evening I went to training. 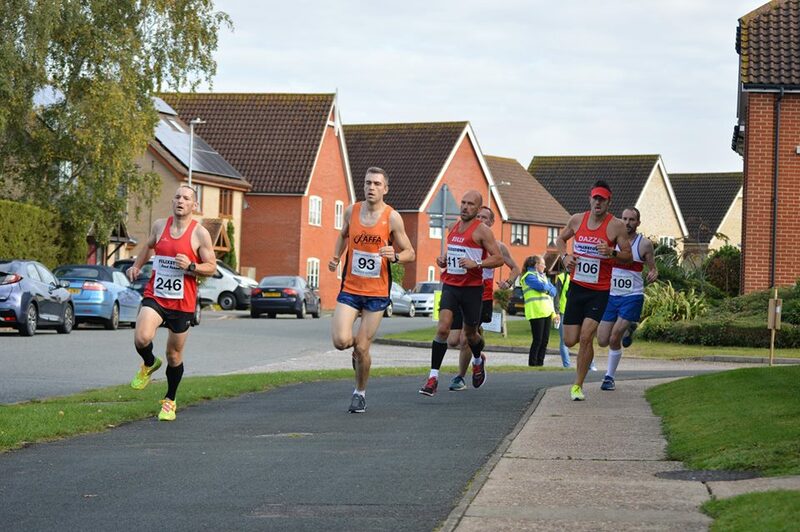 As usual everyone was talking about the Martlesham 10K that weekend. I said ‘This weekend? Crap, I’ve messed up here. I can’t miss this one, it’s Grand Prix.’ Also, I couldn’t miss the family but I had a plan. Friday came and me and family went off to our weekend away. ‘I’ll pack my running gear so I can have a run at Elveden,’ I said. Sunday morning arrived. I said to my wife, Faye, that I was going out for a LSR that morning, which in a way I was. I jumped in the car and drove to Martlesham. I needed a PB today for sure so I could get myself back to Elveden as soon as possible. At the start of the race, me Solly and Dazza were battling for position but I had to speed up and get finished. I pressed on and closed in on my closest rival in the Grand Prix, Jim Last. I could see him in the distance. Every lap, he was slowly getting bigger but unfortunately I ran out of laps and couldn’t quite reach him. I ran straight through the finishing funnel, grabbed by jacket and keys, got into my car and drove as fast as I could back to Elveden. I’m sure my wife realised what I was up to but she never said anything (‘sorry!’) Anyway, a great race and it’s still my PB – 36:35. 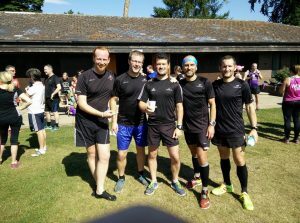 Since joining FFR I have made many friends who have all had a play in me being a better runner and a much fitter person. Thank you all. 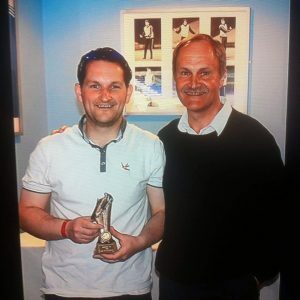 My nomination for next month’s runner profile is Steve Brooke…over to you buddy.